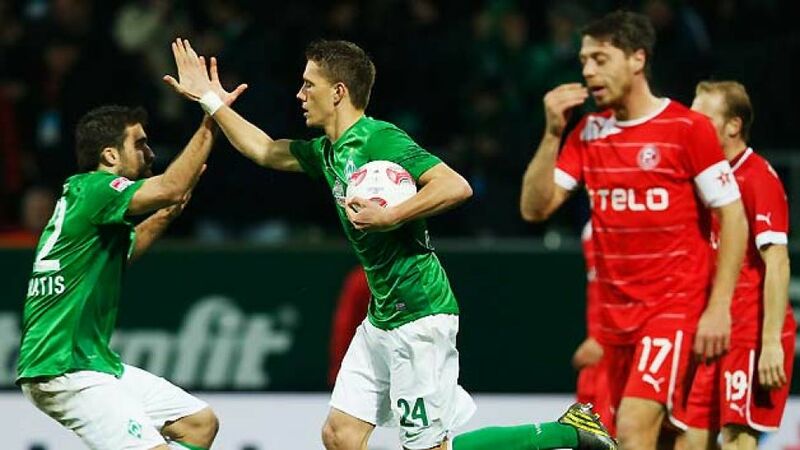 Bremen - SV Werder Bremen returned to winning ways as goals from Nils Petersen and Kevin de Bruyne earned them a 2-1 victory over Fortuna Düsseldorf. The visitors opened the scoring courtesy of a Jens Langeneke penalty, but having dug in to deny Bremen a clear sight of goal in the first half, the promoted outfit saw their hard work undone when Petersen levelled the scores soon after the restart. Assani Lukimya was sent for an early shower late on, but Bremen responded positively as de Bruyne's strike earned them an important three points. Werder set the pace early on, but a single counterattack proved enough for the visitors to take the lead against the run of play. Robbie Kruse broke forward before being felled inside the area by Sokratis' rash challenge, allowing centre-back Langeneke to step up and coolly dispatch his penalty straight down the middle. A last-ditch Juanan tackle denied Petersen an immediate response, but despite dominating possession, Werder's backline looked vulnerable whenever Düsseldorf pushed forward. With 20 minutes gone Kruse danced by his marker to drill across goal only to see an unmarked Ken Ilsö fail to flick the ball over Sebastian Mielitz from the gilt-edged opportunity. Bremen responded as first Petersen and then Elia both fired efforts off target before Langeneke bravely got his head in the way of a fierce drive from the latter. Frequent fouls saw players from both sides go into the book and with no rhythm to proceedings, Werder weren't afforded the space to fully utilise their pace on the break. The entertainment factor didn't dwindle after the break and, while an early setback didn't do much to help Fortuna's cause, it certainly breathed new life into the affair. Lukas Schmitz refused to give up on a deflected clearance and, having kept the ball in play, picked out Petersen with a superb cross that the striker duly dispatched. The equaliser settled Werder, who could have gone further in front if Sokratis had flicked his aerial attempt the right side of the post. Düsseldorf were struggling to get out of their own half as Arnautovic became the next Bremen player to waste a clear-cut opportunity, flashing his volley over after Sokratis had picked him out unmarked in the box. Lukimya's sending-off for a second bookable offence with quarter of an hour remaining could have thrown a spanner in the works, but after Petersen twice failed to find the net, de Bruyne was on hand to slam home the winner from Aaron Hunt's cross allowing Bremen to breathe a huge sigh of relief.